If you are having problems with your used golf cart and feel that it needs to be brought in for repair, you won’t find anyone else in the area with as much experience and knowledge about every kind of golf cart out there. 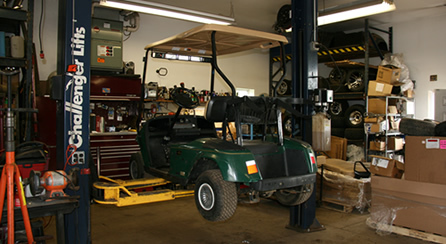 Our procedure is to diagnose the golf cart upon delivery to our shop. Next, we will service your golf cart as well, to make sure that the root of the problem is fixed. This is important to make sure that your golf cart doesn’t have additional underlying problems on top of the initial malfunction. When we have determined the cause of the problem, we always call the customer with a quote before starting the repair of the golf cart. 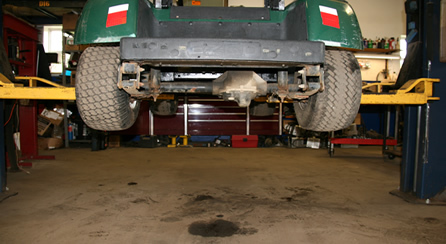 Pull wheels off cart to check bearings, check air pressure in tires, and repair any flats as needed. Rear brakes must be checked, as well as all brake cables. Any necessary adjustments must be made to brakes. Parking brake must be checked and adjusted if needed. Front-end alignment must be checked and aligned if needed. We check all spring bushings and a-arm bushings. Tie-rod ends are checked as well. The oil and rear differential must be checked. Engine service must be completed, including oil, fuel, and air filter inspection. All battery support rails inspected, and repair/replace if needed. Battery cables and battery connections to be cleaned and inspected. If your cart is not charging, you can drop off your charger to be tested. If we find a problem, it can usually be repaired, however sometimes you may need a new charger. If the charger is fine, please drop off your golf cart for service, as the problem may be with the cart.